A mere four hours back down the Stuart Highway from Coober Pedy (or five and half hours up from Adelaide), via Spuds Roadhouse at Pimba, is the galactic town of Woomera. Named after the indigenous hunting instrument that helps users to throw spears further, Woomera is home to craft that furthers science and defence. It's an eerie town. If you thought Coober Pedy was weird, Woomera is also weird… in its own way. Built following World War II in 1947, it reached its peak during the Cold War with around 7000 people living in the village. Allies of Australia (UK and USA) used Woomera Village as the base for their long-range weapons testing. Since the village now only has roughly 150 full-time residents, what was once a bustling centre is now more like a ghost town. 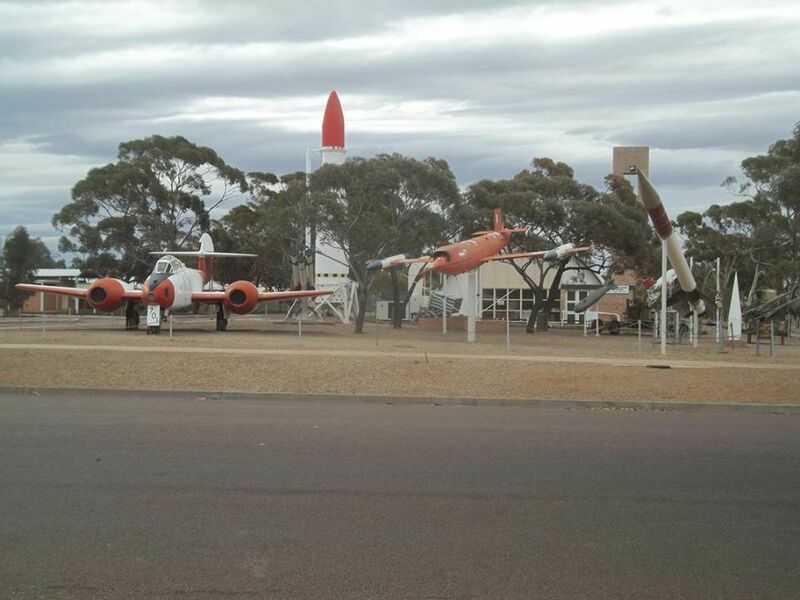 Since 1982, Woomera Village has been open to the public. Other areas in the Woomera Range remain closed off. Because of the large population during its peak, the village boasts a bowling alley, cinema and sporting grounds. There's also the standard necessities of any town such as a school, post office and supermarket. Accommodation to the public is available at Woomera Traveller's Village and Caravan Park and Eldo Hotel; alternatively, motel accommodation is also available at Pimba. However, what most people come to see are the rockets. They're all perched up in a park. Big ones, little ones, fat ones, skinny ones. There's also the things that help line the rockets up to their target and other wild contraptions. Each rocket and contraption has a little sign accompanying it explaining the model, purpose and year of manufacture. Along with the rockets and gadgets are a few aeroplanes and some space junk. At the back of the village on Girrawheen Avenue is a nice, green park with a few enclosures containing different birds and quite a number of empty enclosures. Despite the limited creature-viewing here, it's a nice spot to have a picnic lunch. At the opposite end on the village, on the corner of Barranbali Avenue and Killara Avenue is a quirky little sight. It's worth the quick drive for the slight amusement. The Woomera Heritage and Information Centre is open from 630am to 3pm on weekdays and from 7am to 3pm on weekends. The Woomera History Museum is open from 10am to 3pm on weekdays and is closed on weekends. The Woomera Baker Observatory is open from 830pm every Friday, weather permitting. Bookings can be made on other nights depending on the availability of the volunteers running it. Love the historical intro, the honest description and the pics. Excellent article Teagan. Thanks!